When iOS 9 launched in September, it was easy to understand the potential of Picture in Picture: for the first time, iPad users could continue watching a video in the background through a floating media player capable of coexisting with other apps – it could even stay on screen during Split View. As I cautioned in my review, however, it was also obvious to see how big media companies wouldn't like Picture in Picture: by stripping them of control over player customization, Picture in Picture would provide a universal way to watch videos across iOS with the system video player, which comes with specific restrictions and media limitations. This is the reason why the likes of YouTube and Netflix haven't implemented Picture in Picture yet: relying on Apple's Picture in Picture player would force them to relinquish control of custom player buttons, ads, or other content overlaid on top of videos that can't be shown in the Picture in Picture box. Four months later, the lack of iPad Pro and Picture in Picture support in the official YouTube app is a daily annoyance that has only been partly remedied by third-party YouTube clients like YouPlayer or ProTube. Today, those wishing for a simpler way to watch YouTube videos in Picture in Picture without having to use a separate client will find a solid solution in PipTube, released on the App Store at $1.99. PipTube works by turning any YouTube URL (it doesn't matter if it has pre-roll ads or not) into a video played through the native iOS player, which supports Picture in Picture. PipTube isn't a YouTube client: it is, in a way, just a conversion tool to make YouTube videos compatible with iOS' Picture in Picture and standard video player. How you activate PipTube is the second key aspect of the app. When you find yourself watching a YouTube video and wishing it could continue playing in other apps, tap the Share icon and copy its link. 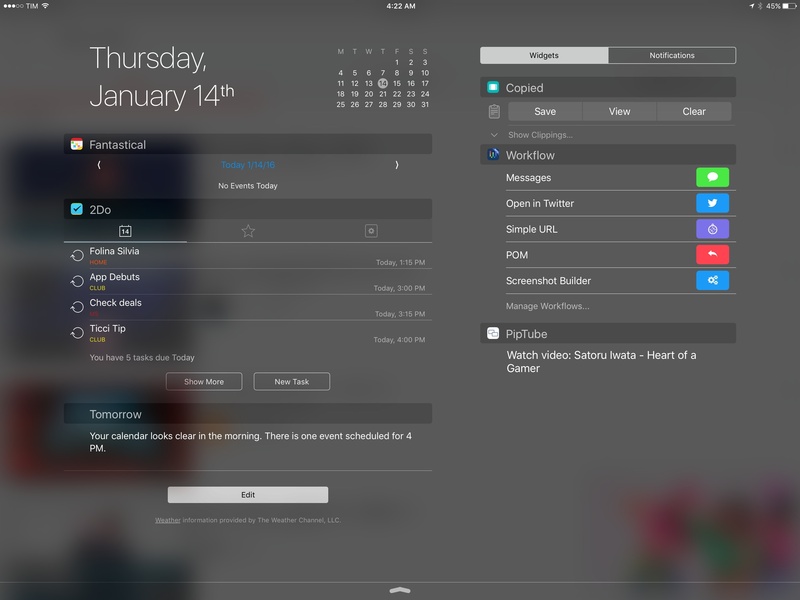 Then, swipe down to open the Today view and tap the PipTube widget. This will launch the PipTube app with the video player loading the YouTube link you just shared. Wait a second for the Picture in Picture button to appear in the player, tap it, and you'll be free to do something else while the video continues in Picture in Picture. Bottom right: the PipTube widget ready to launch a video. Relying on a widget is an ingenious way to provide a fast solution to send copied links to PipTube – it doesn't matter if you find a YouTube link in the official app or in Messenger as long as you can copy it and tap the widget. There's also a nice detail worth mentioning in the widget itself: when you open Notification Center with a YouTube link in the clipboard, PipTube will fetch the video's title and display it in the widget so you can confirm what you're about to launch. Don't want to use a widget to launch PipTube? You can also use a URL scheme to load a link from your clipboard in the app, and you can set the app to automatically start playing links you've copied when you launch it. 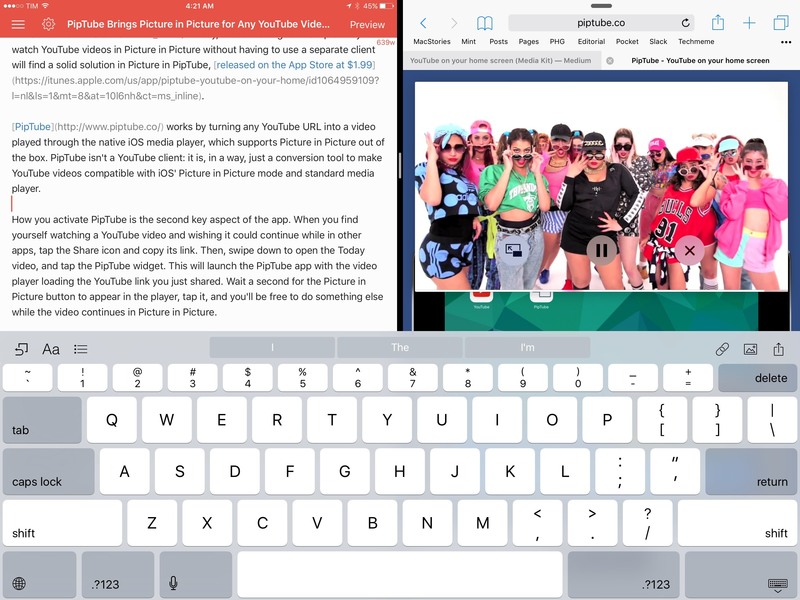 PipTube is a clever and simple way to get around YouTube's lack of Picture in Picture on iOS 9. If you don't want to install a dedicated YouTube client – or if you just like the idea of starting Picture in Picture for YouTube videos from a widget – PipTube works as advertised and it's only $1.99 on the App Store.